At ZAK SURFBOARDS, we offer a broad range of Hire and Demo surfboards through REFRESH YOUR STICK. Refresh Your Stick is a new, easy to use demo program that allows surfers to ride a broad range of surfboard shapes from all the top board brands, including all the latest models and constructions with a choice of the latest fins from top manufacturers. We are also your ultimate ‘try before you buy’ – if you aren’t sure what you want to add to your quiver next or want to make sure the dimensions you are thinking of are right on that next board then Refresh Your Stick is the place to figure it all out, before purchase. Designed with you, the surfer, in mind – Refresh Your Stick allows you to ride as many different boards and fins as you like. A great opportunity to broaden your experience on a full range of equipment and provide you with first-hand user experience. Choose from simple daily hire, right through to a premium subscription package – pick boards and fins to suit your skill level and the surf conditions. 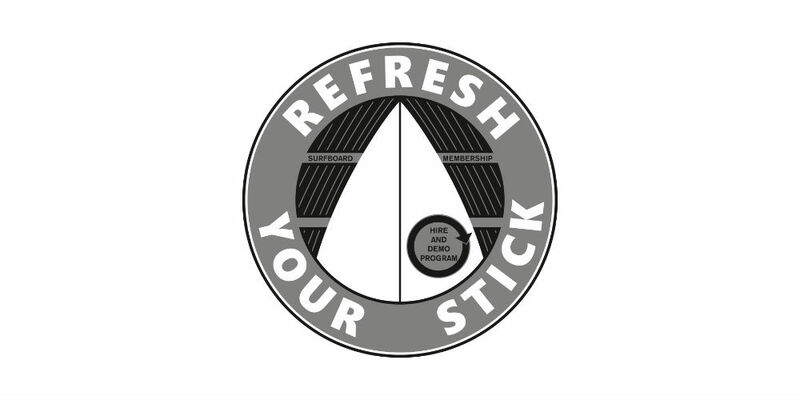 Refresh Your Stick is proud to collaborate with some of the best independent surf shops throughout Australia and hopefully keeping your board purchases with those same local and independently-owned stores. Collaborating with top surf shops means we can keep the board and fins collections up-to-date and fresh. If you wish to hire one of our boards for a commercial purpose eg – Advertising, Photo shoots, Product Promotions etc, we can arrange for you to use pretty much any board in our collection (new or used). – In the case of second hand boards, we will charge you for the repair on boards that are damaged during your hire. – Any damage to new boards will incur the full replacement cost of the board.